Life on Nanchang Lu: Guess what this shop sells? Guess what this shop sells? 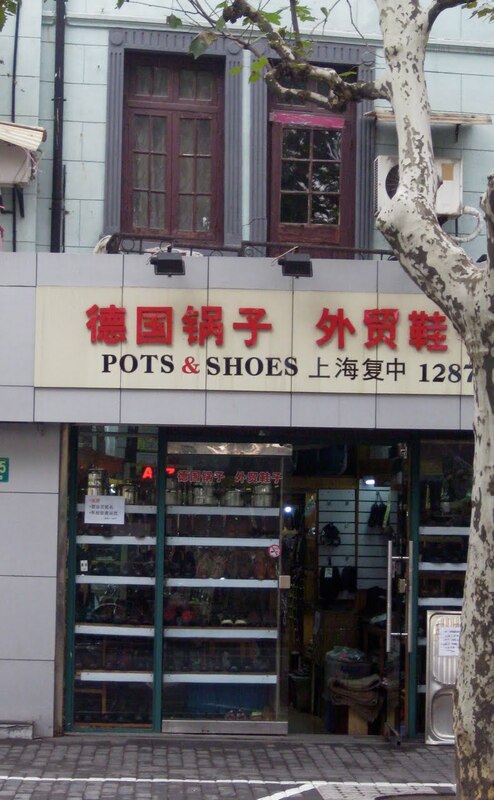 Shops in Shanghai often have....interesting......English names. These names usually have very little to do with what's sold inside the shop. Need a new sofa? Don't go to "Sofa" then, because it sells sneakers. So I was quite surprised to find a shop on Fuxing Lu that sells what you think it does. I just never imagined that selling cooking pots and shoes side by side would be a goer, but you know me......always on the lookout for a place that can solve all my culinary and shoewear needs in one go. Why hasn't this concept taken off everywhere? ?